Join The Ken Blanchard Companies for a special complimentary webinar and online chat beginning today at 9:00 a.m. Pacific Time (12:00 noon Eastern). 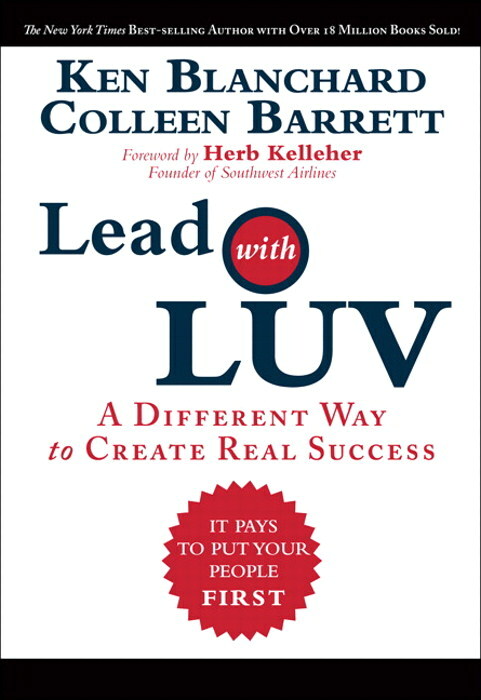 Best-selling author and consultant Ken Blanchard will be joined by Southwest Airlines president emeritus Colleen Barrett to present the key concepts from their new book Lead with LUV: A Different Way to Create Real Success. The webinar is free and seats are still available if you would like to join over 1,500 people expected to participate. Immediately after the webinar, Ken will be answering follow-up questions here at LeaderChat for about 30 minutes. To participate in the follow-up discussion, use these simple instructions. It’s as easy as that! Ken will answer as many questions as possible in the order they are received. Be sure to press F5 to refresh your screen occasionally to see the latest responses. We hope you can join us later today for this special complimentary event courtesy of Cisco WebEx and The Ken Blanchard Companies. Click here for more information on participating. January 26, 2011 in Business Books, Colleen Barrett, Ken Blanchard, Lead with LUV, Webinars. Hi, I really enjoyed the seminar, thank you. I am interested to know how to inspire my peers to move from Managing our team to Leading. You have to teach/lead by example. Show them how to do it! That’s the key. Walk the talk. Following up on an earlier question – I “LUV” the idea of putting the employees first and then focusing on the customers. How would you approach management in order to convince them of that order? The CEO of Southwest instructed people that that was the way it was supposed to be. The president should be more available to a ramp agent than to a VP. Putting people first. The 2nd part is to look at the results of not only Southwest, but Chik-Fil-A, Nordstrom’s, Wegman’s, Synovus… they all get “Servant Leadership” and the importance of people. Look at those companies. I was listening to the webinar today and I really loved everything you and Colleen said. I needed a revamping of my attitude towards work and you were inspiring as always. I hope you and Marge are doing well and that I get to see you soon! LUV! Love coming back to you Alex! Our company is in a turnaround and time is of the essence. Therefore, many believe there simply isn’t time to teach and hardwire this “soft” behavior (their term; not mine). As much as we tie to strategy, goals, patient and employee sat scores, etc. some of sr. leadership believes it will take too long to show needed results. Do you have any stats or can point me to any articles that have reference to timeframe for implementation and results? Before you can really build a good culture, you have to stop the bleeding. Get things stabilized first, then set the vision and values. In the “Titanic,” they couldn’t worry about building a culture while they were trying to get off the boat! Thank you for a great Webinar! I work with single mothers on welfare to help them move to self-sufficiency. I bring the Ken Blanchard books and concepts to the classroom and direct-teach as much as I can from them. I read and re-read others just to keep myself using effective leadership/mentoring skills. I say the my “business” is changing the minds and hearts of women so they can change their lives. These concepts help me every day. Colleen and I think that is awesome! Good luck and God speed! Colleen – How does SWA explain how culture, values, leadership approach, business strategy, etc. work together? Is there a model/picture for this? Thanks! Colleen said that the inverted pyramid is the symbol to use. I agree! I LOVED the webinar!I work with a company that developed Purpose & Values (with the help of Miick & Associates out of Boulder CO – http://www.miick.com/rm.html) a couple of years ago and the webinar has confirmed that we are on track. We can use a refresher on our hiring process and some other matter. I am very energized! What process does Southwest take in introducing their culture to applicants? Does Southwest look for anything the moment applicants enter their facilities to pursue a career/job? We use the “SEAA score” … Smile, Eyes, Attitude & Aptititude. We score folks entering our faclity and if they get a high enough score we move to a 1st interview. I’d like to learn more about the Southwest process in this regard. Colleen said that they introduce the culture to the world first. Most applicants already come to Southwest because they WANT to be part of the culture. They live it and breathe it every day. It is literally a way of life. They start from the application process, and it goes sometimes even after they retire. In the new hire orientation, they teach the history of the culture, and give them access to an on-boarding website that helps them understand the culture. That starts even before their first day. Thanks very much for this adjunct to Lead Like Jesus. (I had the pleasure of meeting you at a LLJ Facilitator’s meeting at Bob Pike’s facility a couple years ago). I have been managing s team of 11 in a lerge medical device business in Orange County, CA – which I am leaving shortly to go to a smaller company. I will be sharing the LUV book with the fellow replacing me. I have found that one person can have a tremendous effect on a small group by following LLJ principles…As you have encouraged others (and shared with me in Minneapolis when we met) – focus on those that you work clodely with, and change is possible by “walking the walk”. Excited about your new opportunity! Keep leading as He led! Please restate the “SERVE” motto. I didn’t get all of the line items-thanks. See and shape the future. Value both people and results. Good on you all! Lead with LUV. It is the only way to get great results and human satisfaction… and besides, it is fun! I was raised, taught to value leading by example. Head down, do your best and good things will happen. That is Conventional Wisdom. However assessing my career of 30 years has led me to believe that is not always true. Much more is needed. Modern Wisdom says on any one thing, give it your best, once, twice, thrice, and if not successful move on to the next thing? What say you? Nobody mentioned anything about compensation. How does it fit in to leading with LUV?